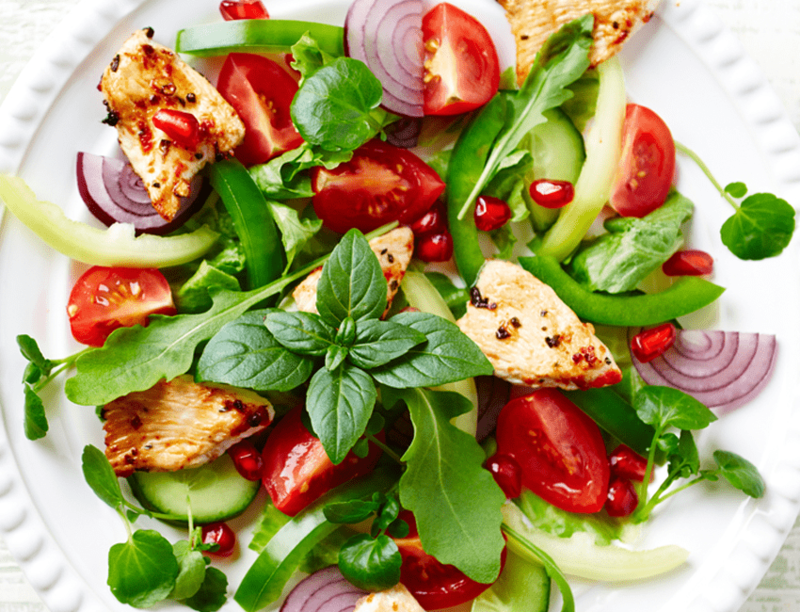 Healthier eating is a breeze when you’ve got a super yummy salad recipe like this one! Slice chicken breasts in half to make them thinner. Then in a medium bowl or resealable bag combine the chicken, olive oil, garlic, rice vinegar, salt, pepper and store in refrigerator for at least 30 minutes. Heat a large pan to medium heat and sauté until tender and cooked through (about 6 minutes per side). Then remove from pan, let cool and slice into bite sized pieces. Combine the arugula, cherry tomatoes, red onion, pomegranate seeds, cucumber and green bell pepper into a large bowl. Top with chicken, drizzle with dressing, toss and garnish with basil. Enjoy! In a small bowl or mason jar combine the Marukan Genuine Brewed Rice Vinegar, olive oil, mustard powder and sugar. Then whisk it all together. Add salt and pepper to taste if desired.